Ah… prime rib of beef! This is a feast of a treat that should be enjoyed at one’s pleasure and not just for special occasions. After all, if they can make an everyday meal out of lobster on a roll, then it’s high time prime rib on a Grace Baking Mini Pretzel Roll enjoyed its official debut. 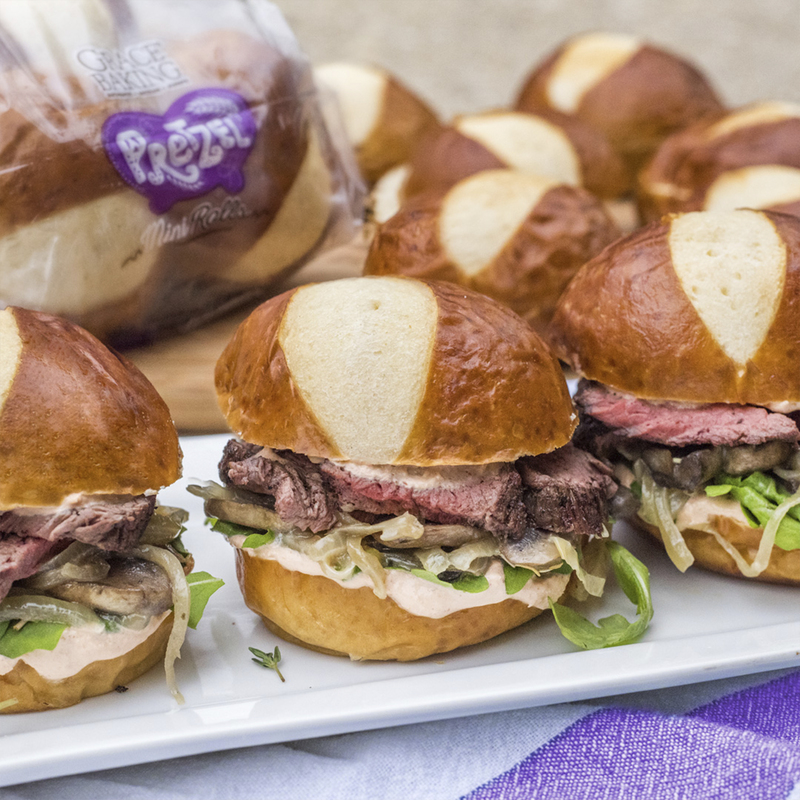 Prime rib has an unmistakably melt-in-your-mouth tender-perfect taste, and Grace Baking has discovered exactly how best to serve it on our teensy-tiny-but-big-on-taste mini pretzel roll. Our team of expert bakery researchers toiled night & day under difficult conditions trying, testing, and toasting to get this recipe just right. And they did. Frankly, it’s about 20 times more delicious than its 35-minute preparation time might suggest. Small bite with a BIG taste and a spicy kick. Melt butter in a large skillet over medium-low heat. Add onions and cook until soft (approximately 10 minutes). Add mushrooms and cook another 10 minutes until soft. Add salt, pepper and thyme, and cook another 10-15 minutes. Make the Horseradish Sauce. In a bowl, combine horseradish, sour cream, Worcestershire and Sriracha. Stir until creamy. Spread Horseradish Sauce on both halves of each roll. Layer arugula, onion and mushroom mixture and prime rib slices on bottom halves of rolls. Cap with the roll tops and serve.